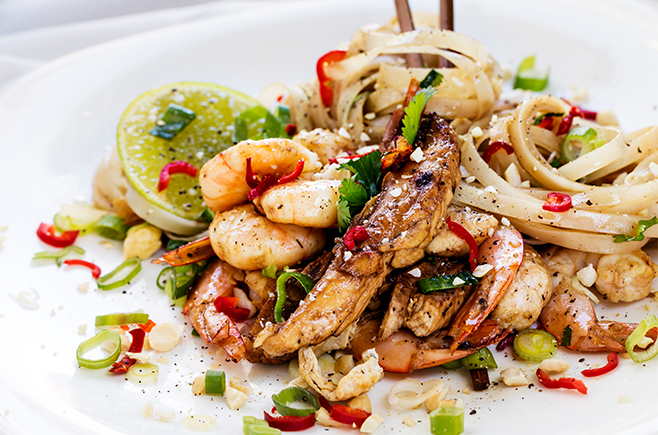 Nutritionist and star of the TV cooking show Good Chef, Bad Chef, Zoe Bingley-Pullin share gives popular Prawn and Chicken Pad Thai a healthy makeover! Combine the eggs with fish sauce. Place a wok on high heat and add a little coconut oil. Add eggs and lightly scramble, once cooked place in a small bowl. Coat the prawns and chicken in sesame oil, lemon, honey and ground pepper. Add a little more coconut oil to the wok and cook the prawns for approx 4-5 minutes and chicken until cooked. In a large bowl full of boiling water, add the brown rice noodles and cook until soft, drain the water and toss in pan with prawns and chicken. In another large bowl mix together chillies, spring onions, coriander, bean sprouts, and noodle mixture. Serve with the cashews and coriander sprinkled on top and a wedge of lime. Brown rice noodles can be food in health food stores and are made from 100% brown rice flour making them a healthy gluten-free alternative to regular wheat noodles. Thanks to Zoe Bingley-Pullin for sharing this quick and tasty gluten-free Prawn and Chicken Pad Thai recipe from her new book, Falling In Love With Food, Nuritional Edge $34.95.